I've never seen this either, Eric. Thanks for showing it. If you ever get a chance to visit Monticello, you should do it. Paris Walks did the Paris of Jefferson and I was lucky enough to be there on that day for their very informative walk, which included the statue. BTW, THE BRIDE OF.....was married to this WILDENSTEIN family. OMG Mr. PHX never heard of Joselyn Wildenstein!!!!! She was married to Alec, the brother of Guy. Some say that Monticello was inspired by London’s Chiswick House of 1729. I wonder where they get that idea? A more fitting object for Th. J. to be holding might be something both he and France have held rather dear, like this object from Bordeaux. I like the squishy Rodinesque clay work on the sculpture. Alexa is right. Montecello is one of my most favorite sites in the Washington DC area. Mr. Jefferson, for all of his "interests", was an amazing man. His home is breathtaking as it sits on a mountain top in Virginia, above the University of Virginia. He was quite the inventor as well as a writer and statesman. Merci for the salute to him, a wonderful piece of sculpture! Jefferson was quite taken with Paris if I remember history correctly. Odd posture in this sculpture. He seems to be bending backwards a bit. Wonder what the artist had in mind when making this sculpture. I love the link info that the hotel de Salm was replicated in San Francisco as the Legion of Honor museum. I have visited that museum in Sf and it is a gem. BTW, there are studies of Rodin's "Burghers of Calais" sculpture there. And one of the several Rodin "Le Penseur" sculptures, which greets you as you enter the courtyard entrance. Madame Simon, you know of this museum, n'est-ce pas? From the sublime to the absurd: our MN Vikings just lost the NFC game, so the New Orleans Saints are going to the Super Bowl. Congratulations to the Saints and their fans. Dammit. I love your take on this wonderful sculpture. & I can vouch for the Monticello recommendations too! I left an homage to you on my blog Eric. I hope you like it. That's always good to come back to the basis, isn't it ? 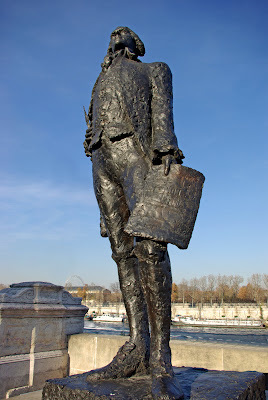 Your photo Eric, invited me to update myself about this huge man, Thomas Jefferson. 'When in the course of human Events, it becomes necessary for one People to dissolve the Political Bands which have connected them with another, and to assume among the Powers of the Earth, the separate and equal Station to which the Laws of Nature and of Nature’s God entitle them, a decent Respect to the Opinions of Mankind requires that they should declare the causes which impel them to the Separation'. And for the support of this Declaration, with a firm Reliance on the Protection of the divine Providence, we mutually pledge to each other our Lives, our Fortunes, and our sacred Honor'. Yes, Anonymous Solemnity. Now, to see how that played out, read the U.S. Constitution and particularly the Bill of Rights (first ten amendments). I am amazed how many people think they know the meaning of "American" and "rights" but have never spent thirty minutes looking over the Constitution. Monticello is only moments away from my home. Around 45 minutes to be exact. There's a hotel near there where I'm more than welcome to stay. Jefferson must have had a special place in his heart for dogs. Like me. I've never been to Paris, but my peeps have. And They love your blog. And I know Parisians would love me, too. If I could only get there. Great man that Jefferson. I'm happy to see new honors to his memory. Eric, you definitely have to go to Monticello some time. And the next time you are in Pittsburgh you have to see the new Fred Rogers (Mr. Rogers Neighborhood) statue. It is that same type of craggy style of statue.